Use the Derby open source database manager to handle the data store for the application. This tutorial uses the open source Derby database. In this chapter, you connect to a Derby database and create the table to be accessed. Alternatively, you can connect to a Cloudscape, DB2® UDB, or SQL Server database. In any case, create the table described in this lesson. Create an SQL database connection . 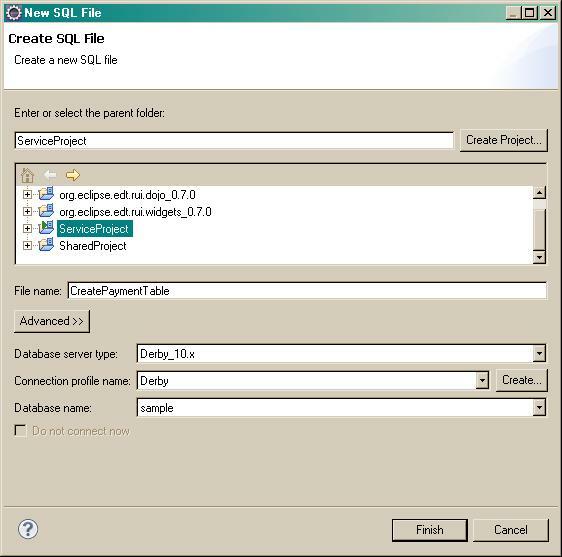 Create a script in an SQL file to create a table within the database. derby_core_plugin - provides the Derby jar files to other plugins in Eclipse. derby_ui_doc_plugin - provides an Apache Derby Nature in Eclipse for easy database application development. Once the Derby nature is added, the 'Apache Derby menu will show the following selections:. To start the Derby server, click Start Derby Network Server from the Derby menu. You should see messages like this in the Console view: <blockquoteWed Nov 23 09:07:39 EST 2011 : Security manager installed using the Basic server security policy. Make a note of the sever port for future use. Click File > New > Other, expand Connection Profiles, and double-click Connection Profile. On Connection Profile window, select Derby as profile type and enter a name and description for your server. On Driver and Connection Details window, select Derby as profile type and enter a name and description for your server. Click Test Connection. Make sure you get a successful response. Click Next to see a summary of the connection information. Make a note of the server URL for future use and click Finish. Click File > New > Other, expand SQL Development, and double-click SQL File. On the Create SQL File window, select the PaymentService project and enter other SQL file attributes as shown in the image below. Close and save the SQL file. From the Project Explorer view, right click on file CreatePaymentTable.sql in the ServiceProject and select Execute SQL files from the menu. Look for results in the SQL Results view after the file runs. The PAYMENT_ID column is an identity column, which means that Derby will place a unique value into that column whenever the user creates a record. Each value is one more than the last. The names of Derby tables and columns are always in uppercase regardless of the case of names that are in the CREATE TABLE statement. 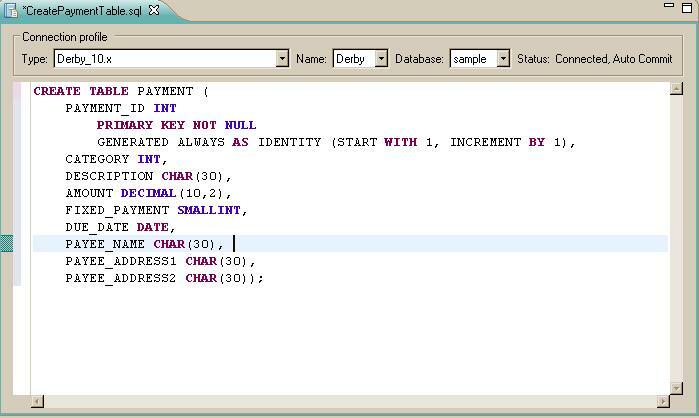 If the table PAYMENT is not created successfully, please create a new .sql and execute 'DROP TABLE PAYMENT', then execute creation table .sql again. You can automatically retrieve the fields for a Record part that corresponds to the PAYMENT table in the PaymentDB database. The column names are the basis of the field names in the Record type. Click File > New > Other, expand EGL, and double-click Record. 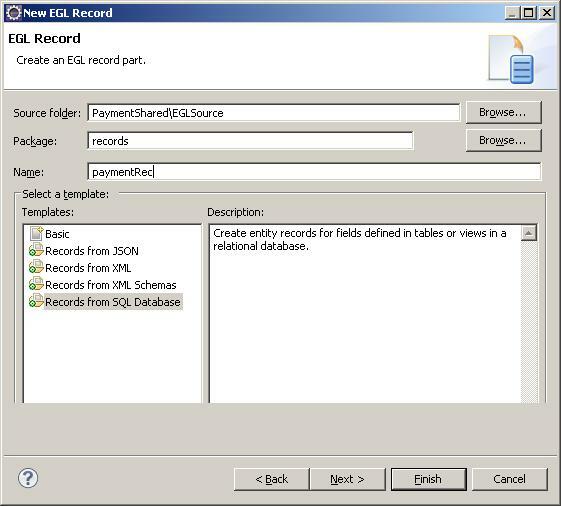 On the EGL Record window, enter Source folder, Package, and Name as shown below, select the template Records from SQL Database, and click on Next. Note that the record is being defined in the PaymentShared project since it is used both by the RUI handler and the service. 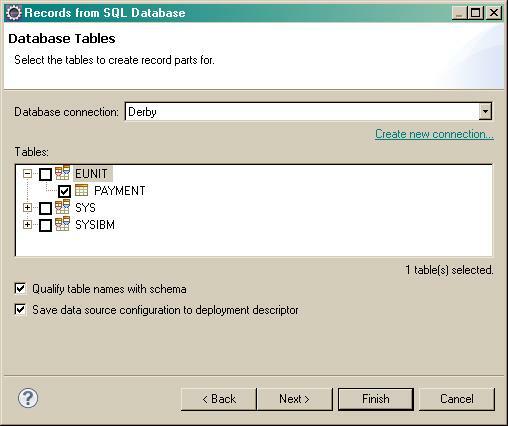 On the Database Tables window, select the Derby database connection and the PAYMENT table, check Qualify tables names with schema and Save data source configuration to the deployment descriptor, and click on Finish. The generated code includes an SQL INSERT statement. The type for fixedPayment has been changed from smallInt to boolean. This change will be useful for defining the user interface during a later drag-and-drop operation. The type for fixedPayment has been changed from smallInt to boolean. The EGL runtime knows that by convention the database uses smallInt for boolean values. To complete the record definition, save (Ctrl-S) and close the file containing that definition. In the next lesson, you develop some of the Rich UI application and view your prototype code in action. This page was last modified 03:58, 12 March 2012 by Smyle Huang. Based on work by Paul Hoffman, lu lu and Ben Margolis and others.